The National Geodetic Survey (NGS) is always interested in updating its products to better serve the needs of our stakeholders. Recently, NGS developed several modifications to the NGS datasheet—the primary method for accessing the passive control network of the National Spatial Reference System (NSRS). 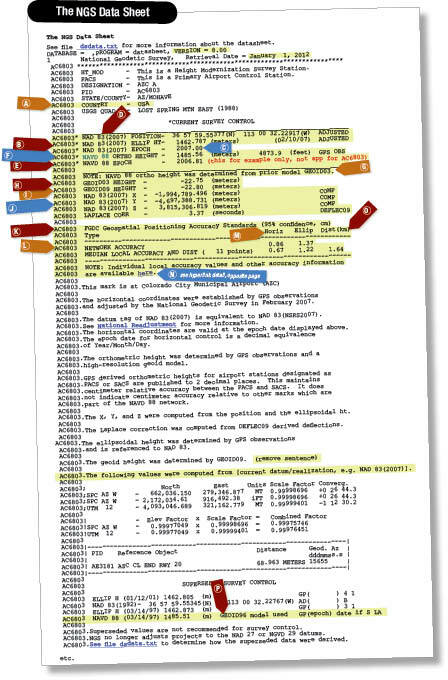 Many developers use NGS datasheets in their products, and NGS recognizes the importance of keeping the public informed of datasheet format changes. Below is a summary of datasheet changes scheduled for implementation in the first quarter of calendar year 2012 and corresponding with the implementation of the National Adjustment of 2011 (NA2011). (A) The COUNTRY field has been added to the STATE/COUNTY section. (B) In the Coordinate Box, ELLIPSOID HEIGHT has been moved from below the coordinate box to inside the coordinate box and is designated as ELLIP HT. (C) The geometric EPOCH DATE has been moved from below the coordinate box to inside the coordinate box and is designated as EPOCH. (D) The DATUM TAG has been added for “B” and “C” above. (F) The orthometric height datum field will now include a hyperlink, in addition to the specific datum referenced by the point. The link will take the viewer to a page on the NGS website explaining the origin of the specific datum used. This datum page will eventually give an explanation for all horizontal and vertical datums. NOTE: NAVD 88 ortho height was determined from prior model GEOID03. (H) If applicable, the geoid model used to determine the published GPS-derived orthometric height has been added. (I) The geoid height computed from the most current geoid model now follows the geoid height noted in “H,” above. The descriptor has been changed; therefore, the hyphen has been shifted to the right. (J) X, Y, and Z coordinates follow the published geoid height. The descriptors have been changed; therefore hyphens have been shifted to the right. LAPLACE CORR: the hyphen has been shifted to the right. (L) Local and network accuracies have been added to the datasheet, with an expanded list of all network connections and their local accuracies, reached through a hyperlink. (N) The median local accuracy is now included, as well as a hyperlink to a complete list of all network connections and their local accuracies. Where applicable, the epoch of the orthometric height will be indicated. (P) The geoid model used to determine the superseded GPS-derived orthometric height will be shown. In order to provide space, the datasheet will no longer provide a meters-to-feet conversion.